For some reason we live in a society that places value on temporarily memorizing stuff. In the real world you can pull out your phone and type in, “What is the difference between maintenance rehearsal and elaborative rehearsal?” and you will get 14,900 results in approximately .47 seconds. People who can remember stuff sound smart, but interestingly enough on the continuum of thinking skills, memorization is at the bottom. Smart people understand what they have learned; they can analyze and conceptualize and support their opinions using facts and details (which they can pull up on a phone in less than a half second, but please do not do that in social situations because it is really annoying as is spouting off memorized factoids). or 2) need to know and understand the material in order to proceed with what I want to do with my life and/or education? Answer 1: If you are fulfilling a general ed. class in an effort to transfer to a four year university and you must get a passing grade on Monday’s exam, you can get by with drill and practice (bottom level of thinking skills – WATCH video below). Answer 2: If you need to know the material for your long term goals, you will want to utilize the highest level of thinking skills to study for the exam and develop a comfortable and confident level of understanding (Highest level thinking skills – CREATE video below – scroll down to Study Steps for Answer # 2). We will look at both approaches to studying for the exam which is scheduled for Monday. Please note it is Friday. 1. 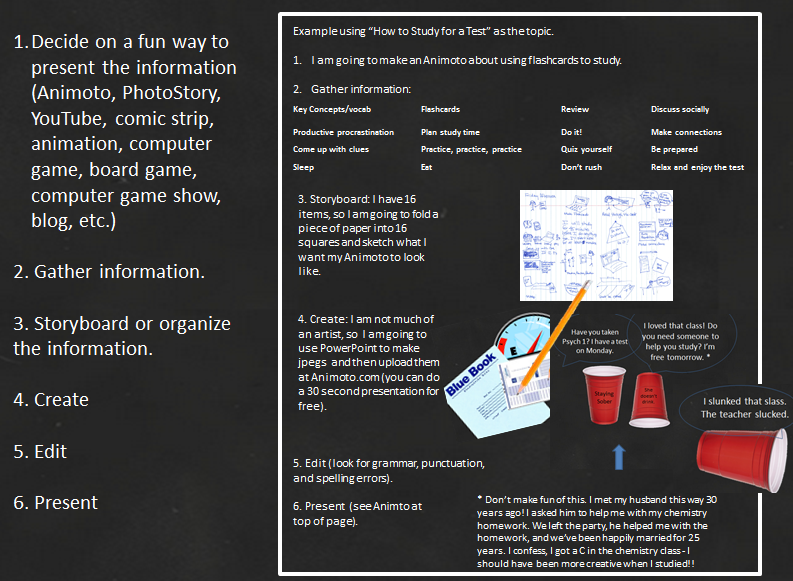 Drill and practice – use a free site like StudyBlue.com to create flashcards and quizzes. 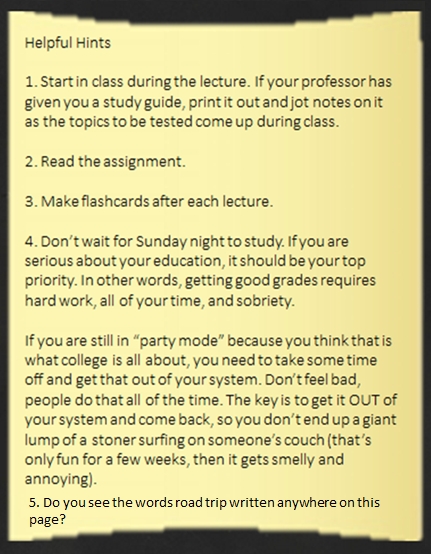 In some cases the cards may already be done for you; all you need to do is plug in your professor’s name and the class. Of course, you can also make flashcards on PowerPoint or on index cards, but I like to use sites that will generate a quiz or game with the information I have plugged in. 2. The information you study should be the vocabulary and key concepts you highlighted while reading the assignment (or if you are lucky, your professor’s study guide). 3. Review (read) the flashcards you created a couple of times. The information may seem overwhelming; how can you possibly remember the difference between maintenance rehearsal and elaborative rehearsal along with 38 other concepts? 4. Talk about what you learned in class during the party tonight (stay sober). This might be easier to do with Psych 1 than Math 2, but you never know, you might run into someone who wants to talk about polynomials. Ask your new friend to study with you tomorrow. 1. Okay, go ahead and get your laundry done and clean up your living space (may as well use procrastination in a productive way). 2. Make a deal with yourself that you can do whatever you want to do today after you have studied the flashcards for at least 45 minutes. 3. Tell yourself to look at them for five minutes now (you can do anything for five minutes). 5. That wasn’t so bad was it; did five minutes stretch into 45? 7. Practice, practice, practice (aka maintenance rehearsal = rote repetition). Ya know there is an app for that – standing in line in the grocery store, waiting for the movie to start, no one to talk to at the party; pull your flashcards up on your phone (pretend its reddit). 1. Practice, practice, practice early in the day. 2. Have someone quiz you or take the quiz on StudyBlue (or the site of your choice). 3. Make sure you have everything you need for the test: pencil, answer sheet, bluebook, etc. DO THAT NOW! 3. Go to bed at a decent hour. 1. Eat a good breakfast. 2. Give yourself plenty of time to park and get to the bookstore (if you need something for the test). 3. Relax and enjoy the test. You have nothing to worry about because you studied for it. All of the above plus . . . . using your higher level thinking skills to CREATE, analyze, evaluate . . . . The absolute best way to learn something (in my opinion) is to understand it well enough to teach it to someone else. Of course the first step to teaching it to someone else, is learning the information. Hmmm? Did that make sense? Sitting and listening to the information in class is not really learning. You need to take the key concepts you heard in class and read about in your text, and do something creative with them. If you do not understand them well enough to do something creative with them, you need to gather more information. YET another benefit of living in the 21st century; you can do all of this from your bed. When I made my first photo montage of the history of the world in ten minutes, I had to use clothes pins (look it up) to hold photos to a music stand and then take split second shots of them using a camera at a local public TV station because movie cameras didn’t come with the phone (don’t even get my 81 year old rocket scientist step-father started). Needless to say, I have a pretty good sense of the order of how things happened in world history. Improve your grades without even getting out of bed!